January started with an all new feature, AFA University. 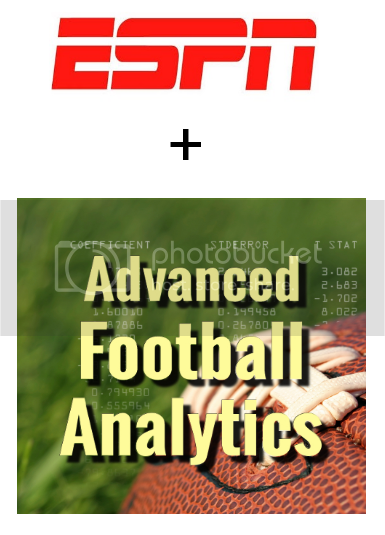 It's a series of short, simple tutorial videos on the basics of football analytics in the style of Khan Academy. The first video was on the Expected Points concept. I looked at how the infamous non-pass interference call affected the Lions-Cowboys game. In January I added a follow-up AFAU video on Expected Points Added. The division round playoff games featured a couple of really interesting games. Here's my analysis on all four, including 2 point conversion and weather considerations. Brian Burke returns to preview the 2015 NFL draft. Dave asks Brian about his “knapsack” metaphor for building an NFL roster and describe the trade-offs the NFL GM’s must make when preparing to bring on new talent. Brian goes on to explain how he re-examined the landmark “Massey-Thaler Draft Surplus Study” with updated data. To close out the show, Brian previews the newly improved and updated Bayesian Draft “War Room” and Draft Trade Evaluator tools and explains how teams and fans can use them during the draft broadcast.